What Should You Do if Water Leaks from Your Commercial Air Conditioner Unit? When they are confronted with a pool of water in their property, most people assume that they have a plumbing problem. This may be the case, but often the origin of the water leak is the air conditioning system. When they install and use commercial air conditioning, Perth property managers and business owners need to be aware of the differences. Let’s take a closer look at how air conditioning leaks occur and how to correct them quickly. Whenever we see pools of water in our commercial or domestic property, it’s an immediate cause for concern. Water damage is an often insidious form of damage that can hide for prolonged periods of time and become progressively. However, this may not be the case, when the water pool has originated from the air conditioning system. The water that you see is actually water that has originated from the air located in your property. The humidity present in our indoor atmosphere is moved via a blower fan in our air conditioning system, it passes over a coil and refrigerant absorbs its heat. This heat is then circulated outside where it’s released, and the process is repeated. During this process, the evaporator coil becomes cold, and condensation can form on it. Sometimes, this condensation will drip and form a pool of water under the air conditioner system. Where Should the Condensation Water Go? When the air conditioning system is working correctly, the condensate that collects on the condensation coil is drained away through a pipe. There is a drip trap located under the condensation coil, it’s sloped downwards to a drainage hole, and the water is supposed to move into the drain away from your system. This system works well, but occasionally there can be a problem and the air conditioner system will leak. This water leakage can leak into your work areas and cause damage to ceilings, walls, and furniture. The usual cause of this problem is a blockage in the condensate drain system. The drainage pipe may become clogged up with debris; this will cause water to backup out of the drain and overflow into your property. Another issue could be that the drainage tray has been damaged, displaced or incorrectly fitted. The best way to avoid this problem is to have a regularly scheduled service carried out to ensure your system is working efficiently. If they are looking for commercial air conditioning, Perth WA business owners and property managers should contact us. 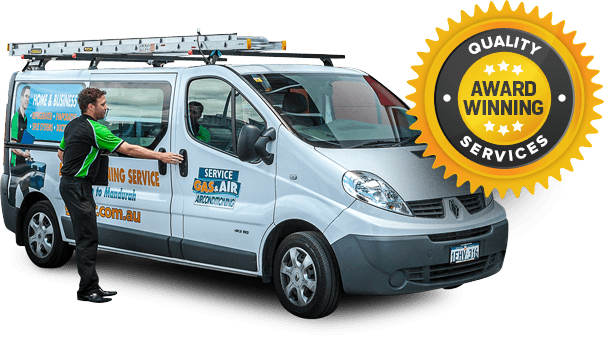 At Gas&Air, we install, repair, and service a wide selection of high quality air conditioning equipment. All of our technicians are well trained to deliver a high quality of service at an affordable price. Our team members are standing by to discuss your needs in more detail, and they will be happy to answer any further questions that you have.